Friday. It was really, really rainy on Friday. Gray, dreary, cold. The perfect baking weather. I also happen to be in love with rainy days, so Friday was a gorgeous day. Not only was I enjoying the sound of the rain pattering onto the leaves of the trees, but the grayness also cast a beautiful subdued light through the windows which I knew would be great for taking a photo of some sort of food. So… I kind of decided to bake something, just to take advantage of the beautiful light. But, as a side note, for you people who prefer the sun over the rain, just be glad you live on Earth where it rains water. For example, a mere 50 light years away, on exoplanet 51 Pegasi b, you’re likely to be pelted with liquid iron! How crazy would that be! Excellent for all our Minecraft-crazed children, though! Haha! So next time you complain about the rain, take a second of your time to be thankful it’s just water falling on you! Anyway, back to Earth. Yes, it was raining on Friday, all day. I wanted chocolate chip cookies, but they had to be relatively quick and easy because I didn’t want to drag out the big KitchenAid mixer and then be forced to handwash the bowl and paddle afterwards (because I’m lazy and hate handwashing). Browsing though my Foodgawker favorites, I found the perfect one at i heart eating. Basic ingredients, no electric mixers required, ready in less than 20 minutes. Yep, that was totally what I was looking for. I took the original recipe one step further by browning the butter, which I felt I really needed to do to make these cookies irresistible. 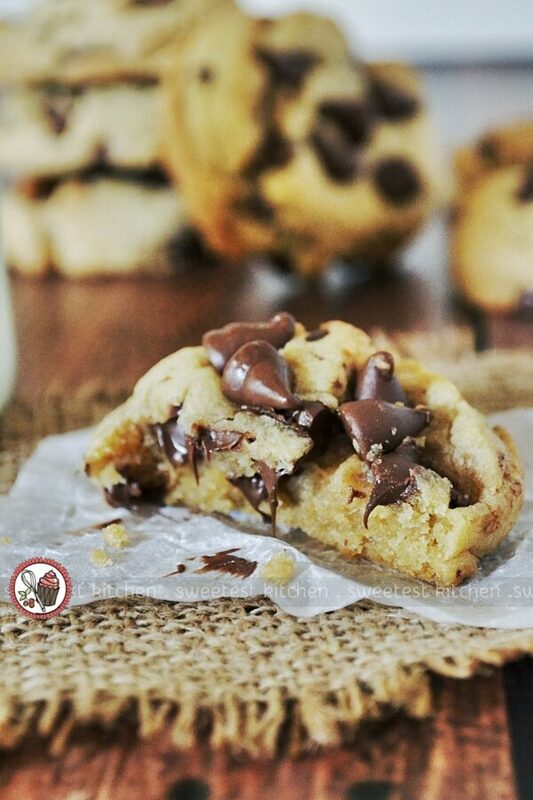 The toffeeish flavor of the browned butter lends a bit of depth to the cookies; incredibly moreish. I also switched up the brown sugar and white sugar, which was mostly due to the fact that I had more brown sugar than white sugar! So instead of the 1/2 cup white sugar and 1/4 cup brown sugar, I used 1/2 cup brown sugar and 1/4 cup white sugar; this seemed to work out really well. I also notice that most chocolate chip cookie recipes call for more brown sugar than white sugar, or at least equal amounts, so I felt comfortable making this switch. Wow. These browned-butter chocolate chip cookies were stellar. I was really happy with how they turned out, and they got the seal of approval from all four of my children, as well, which is really unusual for them all to like the same thing! Who could not like these, anyway? Seriously, look at them, they’re gorgeous! And delicious! They are beautifully soft and chewy, so warm and gooey. They even stay soft for a couple days after baking. What more could you ask for? 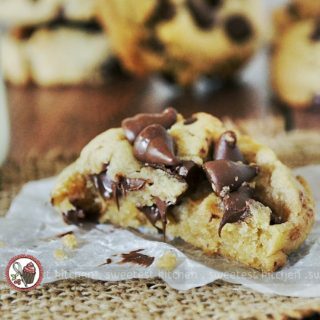 Bake them for fun, bake them for sharing, bake them for a gift, bake them for cake stalls; whatever reason you decide to bake them, these browned-butter chocolate chip cookies are perfect! 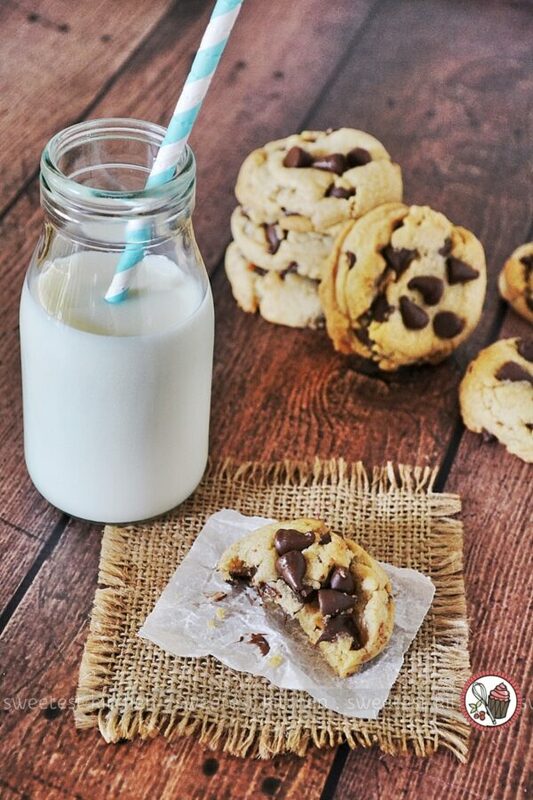 These browned-butter chocolate chip cookies are so easy to make that you'll be enjoying them within the next 30 minutes; no electric mixers required! Place butter in a saucepan over medium-low heat and gently brown the butter, swirling the pan occasionally. It'll slowly start to bubble and boil and eventually start to brown at the bottom of the pan. Take the pan off the heat after you start to notice the brown flecks at the bottom and cool for about 5 minutes. Meanwhile, place both sugars into a medium mixing bowl. Pour in the browned butter and all the brown bits from the bottom. Stir the sugars and butter together until thoroughly combined. Add the vanilla and stir to combine. Add the the egg and stir until the mixture is thoroughly combined, smooth and glossy. Now add the flour, baking soda and salt and stir just until combined; a few floury bits are okay. Pour in the chocolate chips and stir them through until they're evenly distributed and all the flour bits are gone. 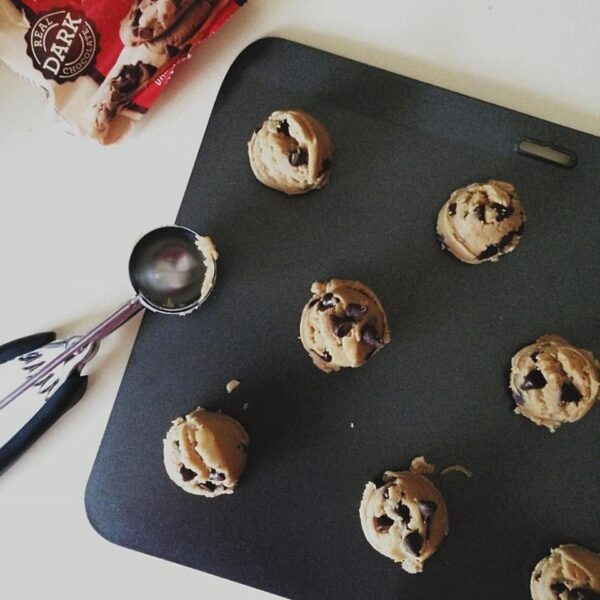 Using a 1.5 tablespoon-cookie scoop, scoop out the dough and place onto a baking tray lined with baking paper. These cookies stay in the shape you put them in, basically, so flatten them gently if you like (otherwise, they'll stay in a mound shape). Bake for 7-9 minutes (mine were perfect at 8 minutes), until just set in the middle and slightly golden at the edges. Do not overbake at all, or you'll lose that beautiful soft texture. Cool on the tray for 5 minutes, then transfer the cookies to a wire rack. Store in an airtight container for a couple of days, they should stay nice and soft. Tip: If you've got about ⅓ - ½ cup chocolate chips leftover, place 4 or 5 chocolate chips on top of each cookie just before you flatten them before baking; you'll get a nice little scattering of whole, melty chocolate chips on top when they're done baking, like in my photos above!